Kirk Cousins' playing time on Saturday night was short, and boy, was it sweet. 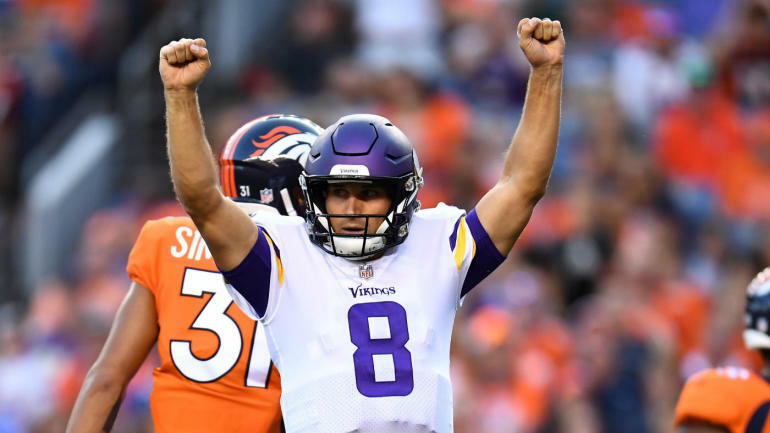 The anointed man under center looked every bit as advertised in his lone drive versus the Denver Broncos, completing all four of his pass attempts for 42 yards and a touchdown for the Minnesota Vikings in their 42-28 win. The yards and perfect completion percentage don't quite jump off the page, but the tape will, length aside. Cousins was confident, precise and looked as comfortable as a new quarterback will ever look. Buoyed by two 20-plus-yard runs by Latavius Murray, Cousins was free to test things out with Stefon Diggs, and all three worked out. Cousins first found Diggs for six yards to open the drive, and then made a key completion, connecting with Diggs on a perfectly placed pass over the shoulder of Bradley Roby for a 28-yard gain. It was the first throw that showed why Minnesota handed the keys and a fully guaranteed contract to Cousins. Cousins looked especially good throwing to Diggs. Three of his four connections were to Diggs for 35 yards, including a 28-yard strike down the right sideline. Cousins said the work is paying off between the two since the start of spring drills in April. That was a month after Cousins signed his three-year, $84 million contract after spending the past three seasons with Washington.